The baby of the family the NAS DTMF Controller is used for wireless Supervisory Control, Switching Controller and Data Acquisition (SCADA) applications. Using 2-way, wireless DTMF tone telemetry, this product provides an economical solution for controlling and monitoring your facilities without the costly build out of infrastructure to access the location. 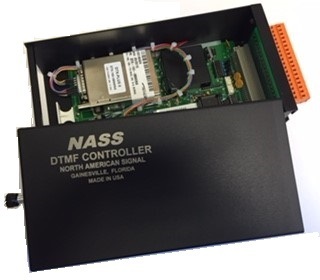 The NASS DTMF Controller is an integral part of North American Signal’s family of products used for wireless Supervisory Control and Data Analysis (SCADA) applications. Using 2-way, wireless DTMF tone telemetry, this product provides an economical solution for controlling and monitoring your facilities without the costly build out of infrastructure to access the location. Outfitted with a 6-watt UHF/VHF radio transceiver operating on your licensed frequency, the DTMF Controller provides security and range not available with products that operate in the unlicensed band. With range up to 15 miles from fixed base sites, the product can be controlled from the ground with a standard 2 way portable radio or configured with a fixed base control facility to operate multiple sites. Equipped with “voice annunciation features,” you will receive over-the-air command confirmation on your 2-way radio or base equipment. Add a TELCO line interface unit to the base and be able to control and monitor your facilities by using the touch pad on your telephone. With 4 Opto Isolated inputs and 2 independent relay controlled outputs, the DTMF Controller provides the capability to monitor and control numerous devices at your facility. Designed with flexibility and simplicity in mind, the unit can be configured in minutes with a portable radio or with the aid of PC. Equipped standard with our low profile chassis, the Controller fits anywhere you can find space and operates on either AC or DC power. The onboard DC-DC converter provides complete battery isolation for isolated ground battery plants. Have a custom application? Not a problem for the staff at North American Signal. We will find a way to adapt the equipment to meet your requirements. For more information click on the manual link above.